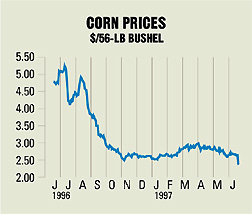 CORN PRICES FELL BACK to their 1992-1995 average, due to bright worldwide crop prospects. Prices rose to an all-time high last July after dry weather in the U.S. substantially cut global output. The U.S. Department of Agriculture predicts American production will rise to 236m. tons in the year to Aug. 1997, up from 187m. last year. Output is forecast to increase to 250m. tons in 1998. The recent weather in the U.S. has been ideal for corn planting, and farmers may overrun their planned acreage. By mid-May, the planters' progress was far better than the recent five-year average. Earlier planting usually leads to better yields. Global output is expected to rise to 589m. tons in fiscal 1997 and 599m. the year after.